Recognized as a major innovator of the weird story, H. P. Lovecraft (1890–1937) was an author whose influence was felt by nearly every writer of horror, fantasy, and science fiction in the second half of the twentieth century. Considered one of the leading writers of gothic horror, Lovecraft and his work continue to inspire writers today. 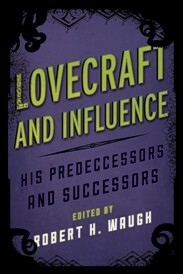 In Lovecraft and Influence: His Predecessors and Successors, Robert H. Waugh has assembled essays that are vast in scope, ranging from the Bible through the Edwardian period and well into the present. This collection is devoted to authors whose work had an impact on Lovecraft—Alexander Pope, Jonathan Swift, Nathaniel Hawthorne, Edgar Allan Poe, and Lord Dunsany—and those who drew inspiration from him, including William S. Burroughs, Ramsey Campbell, Thomas Ligotti, and Stephen King. A fascinating anthology, Lovecraft and Influence will appeal to aficionados of classic horror, fantasy, and science fiction and those with an interest in modern authors whose works reflect and honor Lovecraft’s enduring legacy. ROBERT H. WAUGH is professor emeritus in the English department at the State University of New York at New Paltz. He is a leading Lovecraft scholar, and his books include The Monster in the Mirror: Looking for H.P. Lovecraft (2006) and A Monster of Voices: Speaking for H. P. Lovecraft (2011). Lovecraft and Influence: His Predecessors and Successors. Edited by Robert H. Waugh. Lanham, MD: Scarecrow Press; 2013; ISBN 978-0-8108-9115-9; hardback; 210 pages. This book may be purchased in hardback from Amazon.com or Barnes & Noble or directly from the publisher, Scarecrow Press.